Stay tuned for upcoming events for Musical and Cultural Night in near future. 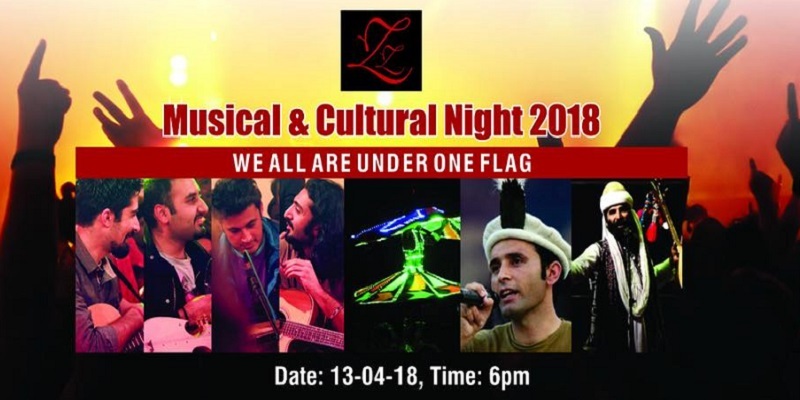 Musical and Cultural Night is set to take place on 13th April 2018 at The Royals Event Complex, Islamabad. Khumariyan, Akhtar Chanal, Salman Paras, Bushra Marvi and Sahil Fayyaz will perform live. Rubab players Bilal Khan Bilal and Atta Khan will also participate. Dancers from Dubai will also display their talent. Dinner and refreshments will also be served. Music fans get ready for Cultural & Musical Night 2018. Copyright © 2015-2019 - eTicketing.pk. All rights are reserved. Best Viewed at 1024 x 768 pixels and above. This Page loaded in 0.09009 seconds on Tue, Apr 23, 2019 (21:27).